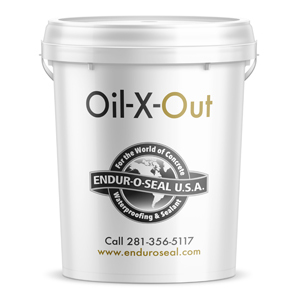 EOS Oil-X-Out, is a biodegradable, severe duty concrete cleaner for oil saturated slabs. Recommended for auto dealerships, truck stops, diesel engine maintenance facilities, fab and machine shops, bank drive through area's, parking lots, driveways, patio's, and more. The polluted areas of the slab are saturated with EOS Oil-X-Out and if the build-up of oil and grease are considered heavy then apply an extra heavy application of EOS G-A Granule Accelerator and scrub into the heavy build up. This may have to be repeated until grease build up can be pressure washed away. Pre-scrapping the floor prior to EOS Oil-X-Out is highly recommended to remove heavy build-up to expedite time. With no standing water apply a saturating application to slab, hand cast a liberal application of EOS G-A Granule Accelerator over saturated surface, allow products to penetrate concrete and emulsify the internal oil, allow product to react with contaminants for up to 4 hours allowing it to purge concrete clean. Pressure wash surface until clean. Use an all Poly hand pump sprayer to apply.